Luckily for Iiyama's latest 27-incher we weren't expecting anything terribly special when we unpacked it, so its awesome image quality adds an extra dimension. But let's not get ahead of ourselves. Just what are we dealing with, here? On paper, it's all very familiar. 27 inches. IPS technology. 16:9 ratio. 2,560 by 1,440 pixels. And an LED backlight. Nothing out of the ordinary. At least, not for a premium 27-inch panel. Except this 27-inch high-res segment has been given a makeover with a new generation of panels. That's not to say that the old gen was bad - they were among the best looking monitors vaguely sensible money could buy - but this Iiyama is one of a new batch of 27-inch panels that directly addresses two of the worst shortcomings of previous models. First up is a smoother, cleaner and less sparkly anti-glare coating. Quite why the earlier models had such horrid anti-glare coatings we have no idea, but it looked a little like someone had gone over the panel surface with fine-grain sand paper. No longer. The ProLite's surface is as smooth as, well, something really quite impressively smooth. The other issue is something known as IPS glow. It basically boils down to a bit of backlight leakage that can be seen from certain angles as a bright glow over dark tones. As you move your vantage point, so the glow shifts over the screen's surface. Not a deal breaker, but we're pleased to say it's been minimised if not eradicated with this newest IPS screen. Then there's the excellent quality of the backlight, which is super clean and super white. Combine that with the smooth anti-glare coating and tight pixel pitch and you have a screen that's impossibly clear and crisp. It's an absolute delight to use. The colours are vivid without being oversaturated, too. As for our test scales, rarely have we seen such detail and accuracy in both blacks and whites. It's exceptionally well calibrated. Is it perfect? No. Samsung's 9 Series and its PLS panel offer better horizontal viewing angles, for instance, and even this latest generation of IPS tech can't match PVA panels when it comes to generating deep, inky blacks. Pixel response is another relative weak area compared with the zippiest of TN panels, but it's hardly sluggish and doesn't detract significantly from the ProLite as either a gaming or movie machine. In terms of features, this is a pretty straightforward panel. 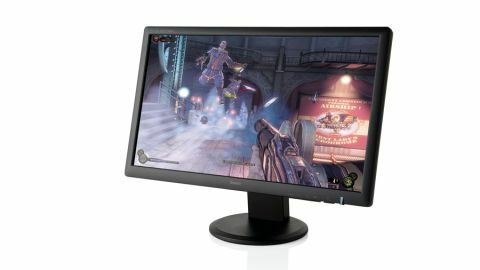 It has a dynamic contrast mode, a comprehensive array of DVI, HDMI, DisplayPort and VGA connections, and the stand offers the full set of tilt, rotate, swivel and height adjustments, but as for more trinkety features like 3D, ambient lighting, motion sensors and the like, there's nothing to be found. This screen is all about image quality, albeit it at a price. The only major snag is that Viewsonic's VP2770-LED offers something awfully similar for a little bit less.